Composer Nicola Lefanu was 70 last year [see my interview with her], and it is nice to see that the flurry of performances of her work is continuing. On Sunday 4 March 2017, the Octandre Ensemble (artistic directors Jon Hargreaves and Christian Mason) are presenting a composer portrait of Nicola Lefanu at the Print Room, Coronet Cinema, Notting Hill. The ensemble will be joined by soprano Sarah Dacey and the Ligeti Quartet to perform music by Lefanu, her mother Elizabeth Maconchy, and Lefanu's husband David Lumsdaine. Lefanu's The Same Day Dawns for soprano (Sarah Dacey) and ensemble sets vivid fragments from Oriental poems, while Deva casts solo cello as goddess, charting a metaphorical journey through a landscape of sensuous instrumental music. 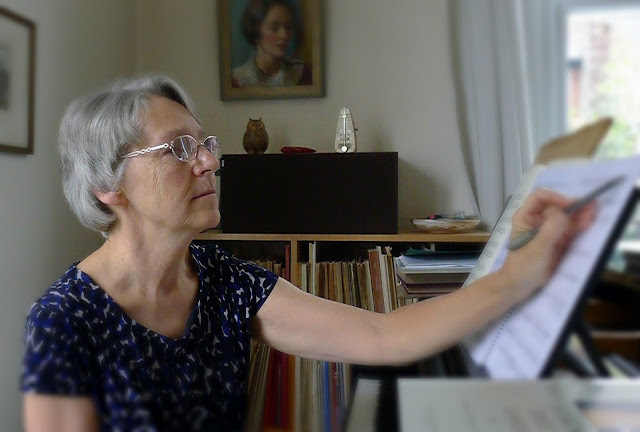 The Ligeti Quartet will play Lefanu’s second string quartet, and music from Elizabeth Maconchy's String Quartet No. 6. And the programme is completed with David Lumsdaine's Blue upon Blue for solo cello. Further information from the Octandre Ensemble website. The programme is the first of a series of composer portraits the ensemble is giving with Rolf Hind (13 May) and Frank Denyer (17 June) to come. Full details from the Octandre Ensemble website.